In this 1968 black and white sequel to At Midnight..., Coffin Joe returns to once again look for the perfect woman to give birth to his son. This time, instead of cruising around town, he brings a bunch of ladies home. He uses a series of tortures to find out which one has a black soul that can match his and be worthy enough to mother his child. Eventually, Joe gets sent to Hell, where he must face the evil of his own madness! José Mojica Marins wanted an air of authenticity to the film. So during one of the scenes, 50 real live tarantulas were allowed to crawl all over the sleeping ladies! 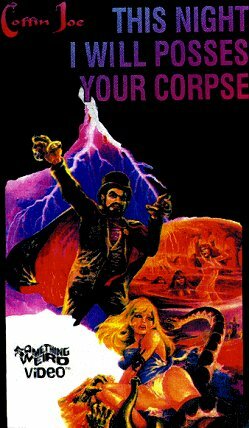 But the best part comes when Coffin Joe gets sent to Hell. José Mojica Marins only had one can of color film. So he saved it for that 10 minute segment. There's nothing better than Hell IN FULL COLOR!